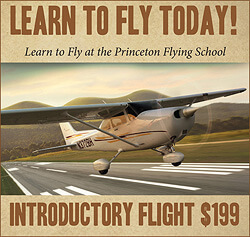 Introductory Lesson Frequently Asked Questions - PRINCETON AIRPORT ~ Learn To Fly Here! Congratulations on Scheduling Your Introductory Flying Lesson. We look forward to meeting you and providing you an amazing experience on your introductory flight. Q: How does the Weather influence my Intro Flight date? A: There are some weather conditions that may impact your lesson scheduling. For instance, the winds may be too strong or the clouds may be too low. We have to be able to see a certain distance and if those things are not in accordance with certain regulations, we can't fly. Since we want to make sure that when we schedule an instructor and a plane for you, that the weather is in line with this experience. Unfortunately if the weather is not cooperating we're going to have to reschedule your Intro Flight for another time. Q: Will you contact me if the weather prohibits my Intro Flight? A: Yes. 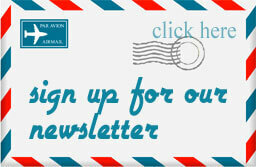 We usually contact you the day before you are scheduled if we can determine bad weather. However, sometimes we do need to wait for within an hour or two of your lesson to let you know, because sometimes the weather predictors are not as accurate as we want them to be. Q: How early should I arrive before my scheduled flight time? 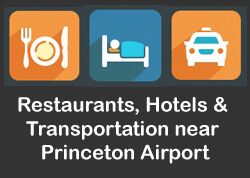 A: Plan to arrive 15 minutes before your scheduled flight time. We have a small amount of paperwork for you to fill out. And we have two lounges, one on the first floor and one on the second floor. We coffee available and you will have time to see some of the action on the field from our second floor lounge. 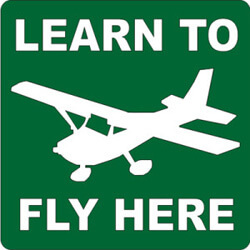 Q: How old do I have to be to take an Introductory Flying Lesson? A: Your age is not important, but your height is. You have to be tall enough to reach the pedals of a car. That's the criteria. And if you are very young, realizing that you cannot go by yourself or solo until you have enough training. Q: What clothing is recommended? A: You should wear comfortable clothes. During the winter it might be a little chilly, so wear a sweater or a coat. In the summer, please wear lightweight clothing that is comfortable because it can get a little warm during the flight. There are no air conditioners in the training planes. A note about shoes... Please do not wear open toe shoes because you will be steering the airplane with your feet. And you will be controlling brakes on the wheels of the airplane with your feet. So heels will present problems. Otherwise running shoes or leather shoes will work best. Q: May I invite passengers to join me on my Introductory Flying lesson? A: Yes. However there is an additional fee of $50 per person and there is a maximum of two additional passengers allowed whose combined weight does not exceed 300 lbs. Q: May my passengers take pictures? A: Yes. We encourage you to take pictures because this is an awesome experience. It is the experience that you have that your pictures will reflect, you will not be able to describe the emotion that when you come down from that lesson, there are some people that words are just not enough. Q: Does my Introductory Lesson flight time count toward my Private Pilot's License requirement? A: Yes. At the end of the lesson you will receive a certificate confirming your initial lesson and time that counts towards your private pilot license.